The year 2019 has not been very smooth for the healthcare sector so far. Starting from the U.S.-China trade tussle, regulatory hurdles to a soft global economy, there have been various factors impeding growth for the sector. In fact, all major healthcare indexes have underperformed their broader indexes year to date. In this context, the S&P 500 Health Care index has returned 3.8% in comparison to around 16% of the broader S&P 500 index. 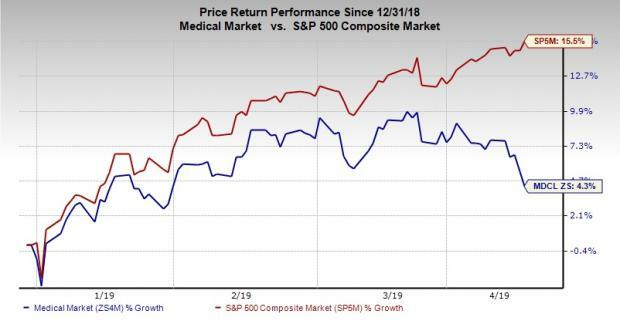 Moreover, the Zacks Medical Sector has returned 4.3% year to date, underperforming the S&P 500 index. Let’s take a closer look at the factors that have been making it a bumpy year for the healthcare sector. The healthcare market is faced with short-term hurdles related to the U.S.-China trade tensions. According to a survey conducted by the Medical Imaging & Technology Alliance (MITA), the tariffs will cost medical product companies nearly $138 million every year. Companies will be compelled to reduce workforce and investments in R&D to meet this ‘new and unnecessary expense’. This also raises the chances of costs being passed on to end users, making healthcare more expensive. Moreover, the U.S. pharmaceutical industry has been hurt by rising raw material costs. Trump’s levying of trade-related tariffs on China has proved to be rather counterproductive for many industries which might make things worse for the healthcare industry. As data management is an integral part of the healthcare system, protecting it is necessary. A survey report by KPMG revealed that around 81% of health care organizations experienced data breach in two years starting 2015-end. Going by the same source, medical device threats are ranked as a top information security issue by around one-third of industry executives. For instance, last April, the FDA had to issue a Safety Communication to inform patients about the availability of an additional firmware update to combat cybersecurity risks discovered in Abbott Laboratories’ implantable cardiac product and manage rapid battery depletion. Stringent regulations have been troubling for players in the healthcare space. Government scrutiny of high drug prices, unfavorable reimbursement mix and Unique Device Identification (UDI) system by the FDA are some of the hurdles. Adding to the woes, the medical-device tax repeal amendment is just temporary. The tax will be back in effect starting Jan 1, 2020. Other issues like a soft global economy, unfavorable health insurance policies, pricing pressure, escalating brand competition, a slowdown in legacy products and major pipeline setbacks have been looming over the healthcare space. Despite the headwinds, the healthcare space is flooded with opportunities. Rising healthcare expenditure, unhealthy lifestyle practices along with expanded treatment options will continue to drive the space. Per a Centers for Medicare and Medicaid Services report, U.S. healthcare spending is projected to rise to around $5 trillion by 2027, representing 19.4% of GDP (based on the assumption that the Affordable Care Act will continue through 2025). AI, cloud-based technologies and increased R&D focus have lent a competitive edge to biotech companies. The use of AI has begun to revolutionize research activities in the industry as it can drastically reduce time and costs involved in developing life-saving drugs. Companies like Veeva Systems VEEV and athenahealth’s ATHN focus on cloud-based services deserve a special mention here. The healthcare space is largely dependent upon demographic factors like an ageing population. In this regard, the U.S. Census Bureau report shows some interesting data. In 2050, people aged 65 or more are likely to total 83.7 million, almost double its estimated population of 43.1 million in 2012. Data also shows that the median age is increasing in most areas of the country and the global scenario is pretty similar. Mergers and acquisitions (M&As) are a major driving factor for the sector. The U.S. healthcare supply chain is consolidating fast, with deals across the industry involving insurers, pharmacies and drug distributors. New tax reforms have proven beneficial to more healthcare companies. This will also encourage companies to invest in healthcare start-ups or participate in M&As to diversify business. Valuation is a tricky business for players in the healthcare sector. Not to forget, these companies spend a lot on R&D and hence it is difficult to account for such high expenses. One might gain a fair idea of the industry’s relative valuation from its Price/Book ratio. 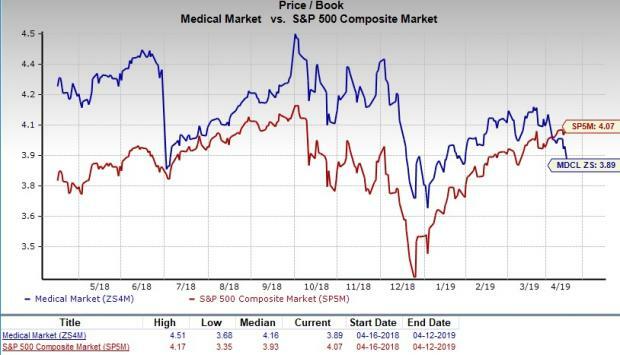 The Zacks Medical Sector currently has a Price/Book Trailing Twelve Months (TTM) ratio of 3.89 with the median level being 4.16 in the past year. The space looks quite discounted when compared to the market at large as the Price/Book TTM ratio for the S&P 500 is 4.07 and the median level is 3.93. The healthcare space might have seen a sluggish year so far. But its valuation and near-term prospects make it a good space for investments right now. Below we discuss a few ETFs that seek to provide exposure to the healthcare sector (see all Health Care ETFs here). The most popular healthcare ETF, XLV follows the Health Care Select Sector Index. In total, the fund holds 62 securities in its basket, with the pharma sector taking the largest share at 32.5%. Healthcare equipment and supplies, healthcare providers and services, and biotech also have double-digit exposure each. The product manages nearly $18.68 billion in its asset base and trades in heavy volume of around 12 million shares. The expense ratio is at 0.13%. XLV has a Zacks ETF Rank #1 with a Medium risk outlook. The fund has returned 8.8% in a year and 3.8% year to date (read: Beat Q1 Earnings Woes With These Sector ETFs & Stocks). The fund’s top three holdings are Johnson & Johnson (10.6%), Pfizer Inc. (6.9%) and UnitedHealth Group Incorporated (6.6%). The Vanguard Health Care ETF seeks to track the performance of the MSCI US Investable Market Health Care 25/50 Index. This fund comprises stocks of companies involved in providing medical or health care products, services, technology, or equipment. The fund holds 361 stocks in its basket and has a 0.10% expense ratio. It has accumulated $10.7 billion in its asset base and trades in average daily volume of 318,747 shares. VHT has a Zacks ETF Rank #1 with a Medium risk outlook. The fund has returned 8.8% in a year and 5.4% year to date (read: U.S.-China Trade Talks Begin: 5 Safe ETFs to Follow). The fund’s top three holdings are Johnson & Johnson (9.3%), Pfizer Inc. (6%) and UnitedHealth Group Incorporated (5.9%). The fund provides exposure to U.S. companies that manufacture and distribute medical devices by tracking the Dow Jones U.S. Select Medical Equipment Index. In total, the fund holds 56 securities in its basket with net assets of $3.55 billion. It trades in good average daily volume of 230,000 shares and charges 43 bps in fees per year. The fund has a Zacks ETF Rank #2 with a Medium risk outlook. The fund has returned 21.2% in a year and 14.4% year to date (read: 10 Top-Ranked ETFs Leading the 10-Year Bull Run). The fund’s top three holdings are Abbott Laboratories (13.6%), Medtronic plc (11.5%) and Thermo Fisher Scientific (11.2%).